Basic feathers are..basic. But they're not to be ignored! Their simplicity makes them a great base for Feather projects, when you don't need a wireless network, or built-in datalogging. These were the First Feathers, as it were. They form the basis of later Feathers, so if you start here you can upgrade! ATmega32u4 is a well known 8-bit AVR processor, and may be more familiar to people who use the similar Arduino '328s. It's tried-and-true. 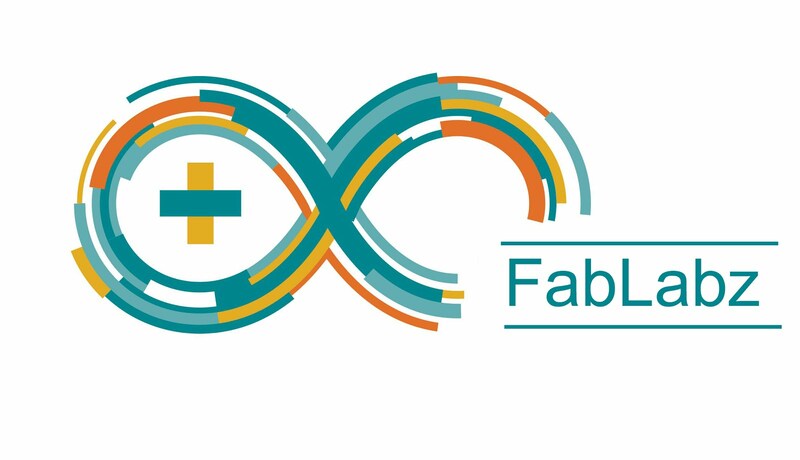 The Arduino core for it was first developed in 2012 and so it's quite stable and well-known. Many low-level ATmega328 examples will work out of the box on the 32u4 (but not all!). It has 32KB of Flash and 2.5KB of RAM. It runs at 8 MHz and has native USB support. The ATSAMD21 M0 is a 32-bit Cortex M0, with a ton more flash and RAM: 256KB and 32KB. It is also supported in Arduino but is a little newer (circa ~2015) and so does not have as many years of projects and example code already. It's also a completely different chipset than the AVR, so low level code will not work and must be re-written. That said, its about the same price and you get a ton more speed (48 MHz and 32-bit processing), and peripherals. For example you can easily create multiple hardware UARTs or I2C ports, which is impossible on the AVR. Other stuff like I2S audio, 12-bit analog input, and true analog output (DAC) is only available on this chip. Especially if you're running low on Flash, RAM, or analog inputs, this is a nice upgrade. Compared to ZigBee, BTLE or LoRa/Packet radio, WiFi can transfer a lot more data a lot faster! You can easily stream compressed audio over WiFi. Compared to just about any other wireless protocol, WiFi is strongly supported by every computer/tablet/phone, has strong encryption built-in, and can reach anywhere around the world! All of our current WiFi Feather options support WPA PSK passcoding and SSL encryption. The full capabilities of SSL may vary, and you may have to do a little extra work for adding the SSL certificate to the module for true SSL checking. The Feather Huzzah ESP8266 is a perennial favorite. 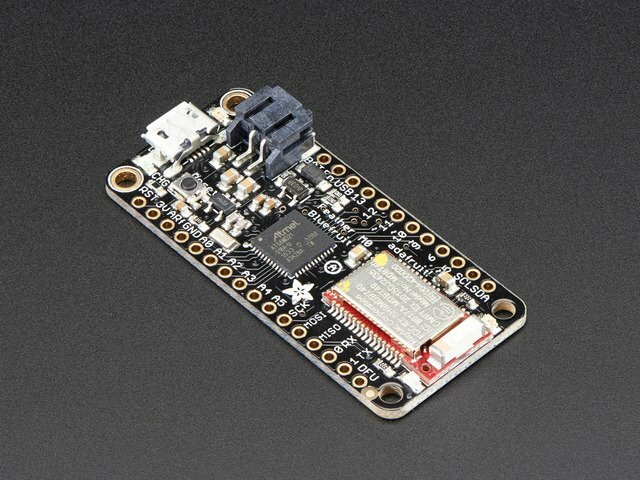 It features an FCC/CE certified ESP-12 module that contains an ESP8266 chip, 4 MB of SPI flash and antenna. No real datasheet or in-depth documentation. Most information is community-sourced or 'word-of-mouth'. Tech support is minimal. 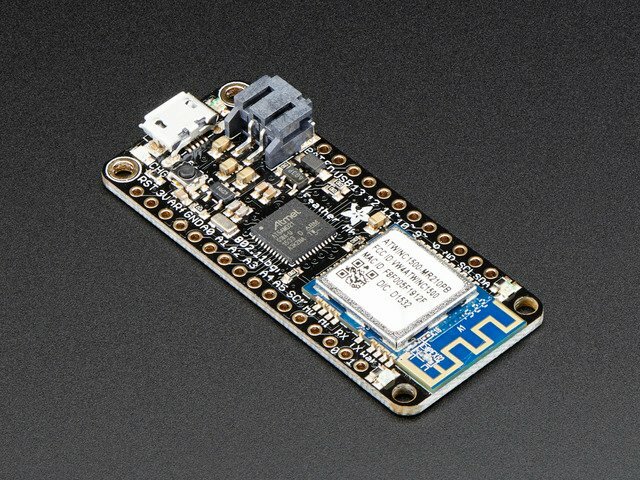 For the most part, the low cost of the ESP8266 has been enough incentive for people to overlook the drawbacks of the chip and figure out how to create projects with what they've got. The Feather M0 + ATWINC1500 is a pairing of chips: there's a main processor (the Feather M0 part) and the wifi processor module (the ATWINC1500 part). As such, these Feathers are more expensive than all-in-one WiFi solutions. But, as a positive, they have a really powerful and well-documented main processor that runs separately from WiFi which can give you more control. Main processor is well-known and documented Cortex M0+ chip. 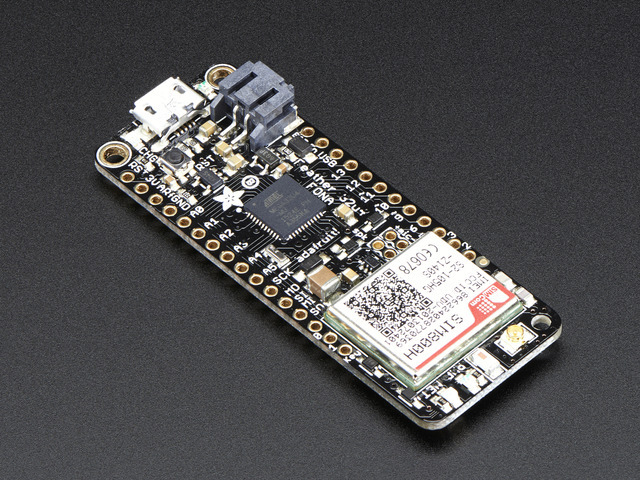 WINC1500 has official support from Atmel/Microchip. Lots of GPIO, analog inputs, two analog outputs, peripherals a-plenty! No detailed documentation about peripherals. Support is offered as example code. As of mid-2017, core WiFi and BTLE functionality is supported but some capabilities like classic BT or dual-wireless projects are still in-the-works. The WICED Feather builds on a Broadcom (now Cypress) module, the same used in the Particle Photon. This chip combines an STM32 and BCM radio. Thanks to Thach's amazing software stack, we've taken a very complex and powerful chipset pair and made it trivially easy to get working within Arduino. Works directly from the Arduino IDE, generating native ARM code that runs directly on the target MCU. 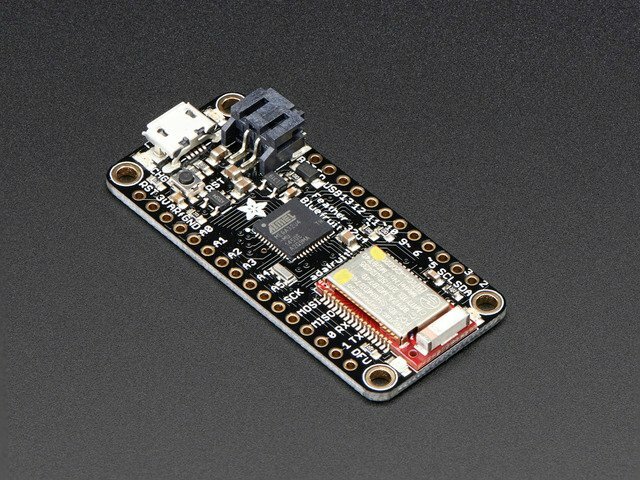 Plenty of GPIO and powerful peripherals, including native USB support with a custom USB DFU bootloader for programming from the Arduino IDE or from the command line. Fast throughput due to the efficient WiFi stack and fast multi-lane connection between the MCU and the Broadcom radio. Advanced features for various encryption modes, including TLS 1.2 (required for Amazon Web Services, etc.). The WiFi stack and security libs are black box closed source solutions, meaning we have little influence over bug fixes and getting changes into the code. We're largely at the mercy of Broadcom (now Cypress) for any bug issues, and like any very complex stack there are known bugs in the security and wireless layers. No access to the low level source code since it is under very strict NDA, and we had to bend over backward to implement a layer that sits on top of the NDA code so that we have something we can expose. Bluetooth is a 2.4GHz wireless protocol that is popular for short range - about 10 meters max. It's very low power and simpler than WiFi. That low power and simplicity has made it the most popular point-to-point wireless transport - you now get a Bluetooth transceiver in every phone, tablet and laptop. There are, annoyingly, two flavors of Bluetooth: BT Classic and BT Low Energy (introduced as part of the Bluetooth 4.0 standard). And, annoyingly, despite the similar names, they are completely different and not cross-compatible. Bluetooth LE is used for structured data (organized by 'Services', which are made up of individual 'Characteristics'), beacons, keyboards and mice, MIDI, but not audio. It is also the only method exposed to the user in iOS. Basically the thing to watch for is if you want to communicate with SPP devices or BT audio, you can't use LE. If you want to work with iOS, you can't use Classic. Keyboards/mice can be either. 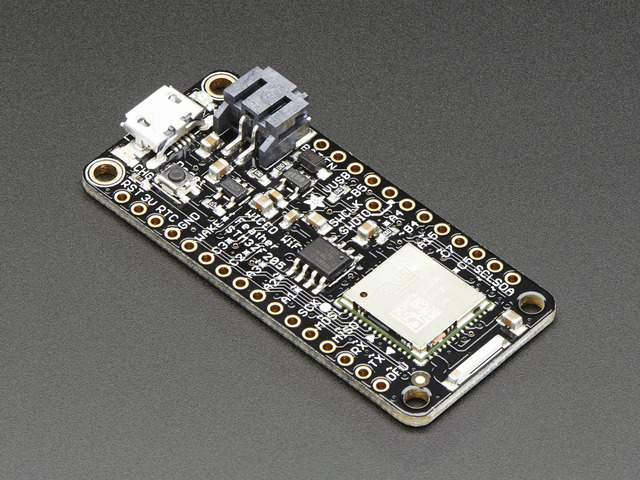 The Feather nRF52 is a new direction compared to our 32u4 or M0 Bluefruit boards. This Feather has only one chip on it - and that chip is both the processor you program and also the Bluetooth Low Energy radio. What's nice about this is you can do more powerful stuff, and faster too, because you don't have to manage two chips. It's also lower price and lower power since there's only one processor, and easier to put into sleep modes. Because everything runs natively, a lot of complexity can be hidden behind simple helper classes, making things like ANCS possible and manageable compared to the nRF51. Much more room to grow due to the MCU capabilities and flash/SRAM size compared to the earlier nRF51832, and more advanced on board peripherals. A new chipset that is not an ATmega328 or ATmega32u4, so some older low-level Arduino libraries and techniques are not compatible. This doesn't happen a lot but if you're porting a project over, you'll have to watch for it! Can not be used as a 'client' with your favorite MCU at the moment (unlike the nRF51), since code all runs natively (making this both a pro or a con depending on your needs). Examples from the nRF51 and nRF52 are not compatible with each other since they have entirely different programming models. Our original Bluefruit Feathers are the 32u4 and M0-based. These pairs are very similar looking, and have the same basic idea behind them: there is a main processor which is an ATmega32u4 or ATSAMD21 and a co-processor module which is the red and silver rectangle, containing an nRF51 which can do Bluetooth Low Energy only. 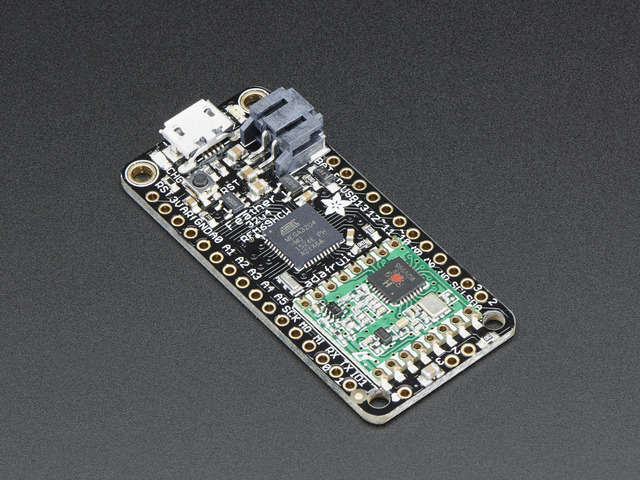 The nRF51 is programmed with our Bluefruit firmware, and can be controlled with AT commands over SPI connection. 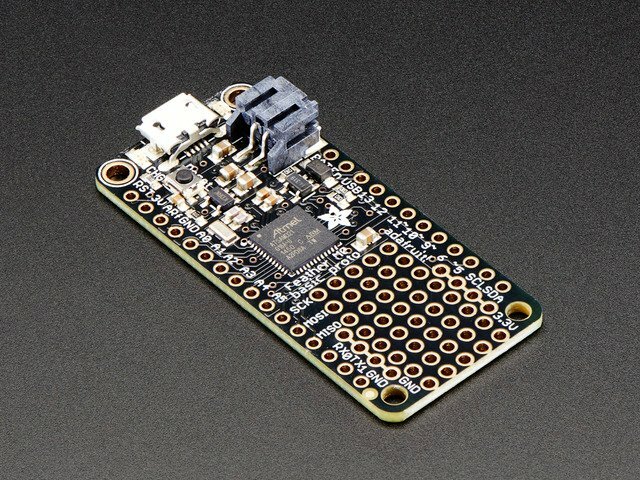 When the main processor (32u4 or M0) wants to send or receive BLE data, it sends commands to the co-processor module. 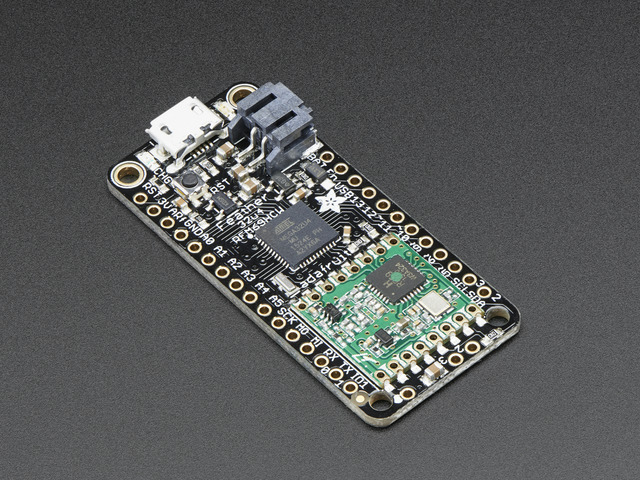 We decided to go this way because the nRF51 did not have as-good a programming setup as the nRF52, and we thought people would have a better experience if the main chip was not also doing the radio work. No need to worry about the Nordic 'softdevice' radio thread interrupting timing-specific code since the radio is completely separate. Can use (just about) anywhere in the world! 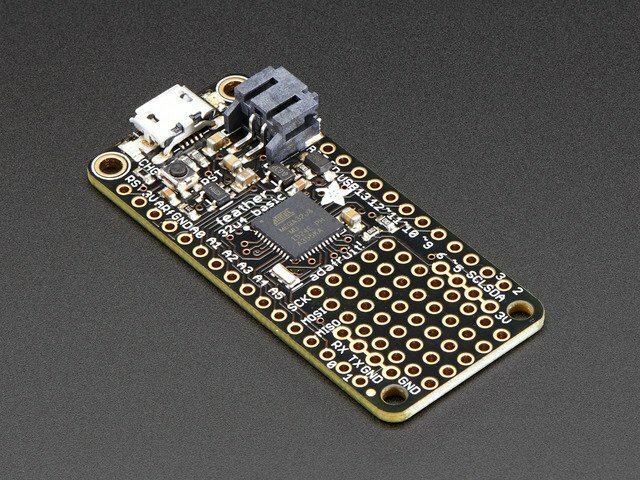 ATmega32u4 is well supported chip, with native USB and full Arduino core. Cellular connectivity can be spotty, especially when roaming. Code needs to be able to manage re-connection. AT commands can be a little clunky, require care and parsing. Antenna placement often trips people up: if it's too close to the main processor it can reset the Feather, so you can't make it too compact. WiFi, Bluetooth, ZigBee and Cellular are everyday wireless protocols you use every day - at home, at work, with friends. Sometimes, though, you need to leave the well-known and venture to the more exotic! The RFM69 and LoRa Feathers let you create a more flexible wireless network. Instead of depending on a WiFi router, Bluetooth Central, ZigBee Master or Cellphone tower, LoRa and RFM69 work well in point-to-point or meshing configurations, with eye-popping ranges. They also don't need complex pairing or connection overhead, turn on the radio and transmit when you like, then turn it back off. They are the "rugged individuals" of wireless! The trade-off is that you'll have to do a bit more work in the software to manage your packets, and re-transmission. Link management and re-transmission is up to the user, so there's a little more work to do! 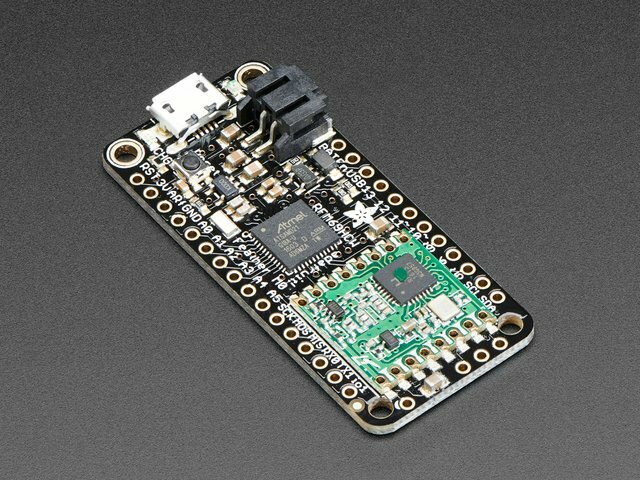 LoRa radio does not have built-in encryption, must be added by hand by the user. Not good for audio/photo or video bandwidths, best for small data packets. Tweaking and tuning of antenna setup required to get the longest ranges. There's a lot of options for these radio feathers, because each chipset (32u4 and M0) has two radio types (RFM69 and LoRa) and then two frequencies (433MHz and 900MHz). That's 8 total options. If you are in a country that allows unlicensed usage of 868 MHz, pick the 900 MHz radio. Both RFM69 and LoRa are 'software tuned' - so just make sure you set the Arduino library code to 868 MHz when you upload it. You can tell what frequency your radio is by the dot on top. Red dot means ~400 MHz, Green dot means ~900 MHz. Then pick your radio type. The lower cost RFM69 doesn't go as far but has a lot of functionality and can do the job for most projects. 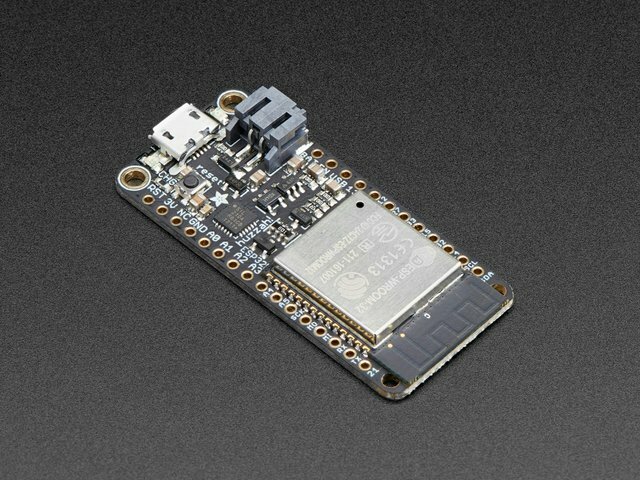 LoRa has much better range, and can be used with LoRaWAN, but has additional cost. You cannot mix and match radios: RFM69 cannot 'speak' LoRa. Both radio modules are identical shape and pinout, so we re-use the same Feather layout for both.